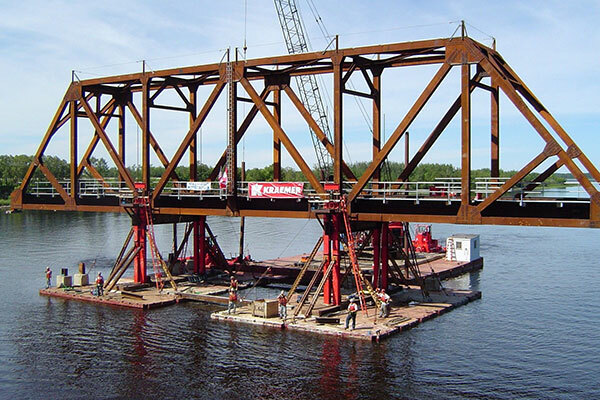 Kraemer replaced five existing bridge spans, including a swing spa, with six new 176-foot through truss spans for the Canadian National Railway’s Rainy River Bridge, which crosses from Canada into the U.S near Baudette, MN. Kraemer erected four of the trusses on a temporary erection platform adjacent to the shore. The four trusses were individually lifted from the erection platform and floated into place on temporary bents adjacent to the piers of the existing bridge. The remaining two trusses were erected on temporary bents adjacent to the existing bridge due to insufficient water for barges. Once the new trusses were built and in place on the temporary bents adjacent to the existing bridge, the old spans were floated out and the new spans were floated into place during three, 2-day switch-outs. In total, 1.8 million pounds of steel was installed on this project.